It’s hard to believe that it is already November and the holiday season is finally upon us. During this busy season of holiday events, cooking, shopping, scheduling and immense planning, it is easy to get sucked up into all of the buildup and stress that this time of year often brings. What is meant as a time for reflectance and family often gets lost in the inevitable hustle and bustle of the season. During this hectic time a simple “thank you” to a family member, friend, coworker, or even stranger, can really go a long way. Take this November to not only reflect on what you are personally thankful for, but also to spread appreciation and gratitude to those around you. Here are a few simple ways to extend thankfulness. Yes, saying “thank you” is considered a common curtsey, but this saying is all too often forgotten or way too generic. Be specific with your appreciation and avoid using generalities that may be interpreted as inauthentic. Let the recipient of your gratitude know exactly how you feel. Share a detailed example of what they did and how it made a difference. No matter how small the act is, it is so important to express your gratitude to others. This verbal acknowledgement goes beyond politeness to help build and maintain stronger relationships. In the age of instant gratification, thank you notes and letters have become a lost art. Through the act of writing out how you feel, you’re able to truly get your message across without the distraction of technological barriers. 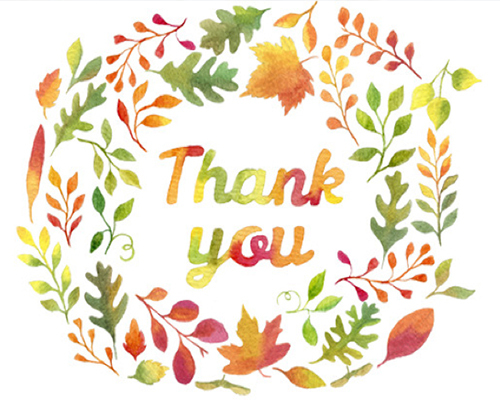 Take the time to show your thanks with a handwritten card that specifically shares how an individual has impacted you or why you are grateful to have them in your life. Not only will this gesture not go unnoticed, but it is a tangible message for the receiver to keep and treasure. In many circumstances actions really do speak louder than words. Show your gratitude by surprising someone with random acts of kindness by offering to help a coworker with a project or task, taking out the garbage for a neighbor, cleaning the kitchen for a spouse or making a friend their favorite treat. Acts of service and investing your time affirms that you value and appreciate the recipient by making the effort to do something thoughtful for them. Giving back to others is one of the best ways to show your sincere gratitude. Express your love and gratitude to someone going through a tough or stressful time. Providing a helpful hand or a listening ear can help lighten the load during an overwhelming season. We all have moments when we need someone to reassure us that it is all going to be ok and work out. Sometimes just letting someone know that you care and are thinking about them can make all the difference.